This morning, when I tuned to Radio Australia on 9,580 kHz, they were not transmitting–or, at least, I couldn’t hear them. I hope this is merely a transmitter glitch (they do happen). You see, Radio Australia recently issued their new shortwave broadcast schedule which included cuts to the Pacific broadcast footprint. The changes take effect today. 9,580 kHz, however, should still be on the air between 09:00-21:00 UTC–this morning, I was listening at 15:00 UTC. I can’t think of the last time I couldn’t hear Radio Australia on 9,580 kHz in the morning hours here in the eastern USA. Indeed, some of my earliest memories of listening to shortwave radio include RA on 9,580 kHz. I need to look further into the changes to the broadcast plan. I’m beginning to wonder if the transmitter output and orientation have been changed. As you can see in the screenshot from my Elad FDM-S2 (above), there is a faint carrier on 9,580, but it’s much too weak to hear. I’ve no clue if it’s Radio Australia or not. Fortunately, Radio Australia is quite loud on 12,065 kHz and very audible on 12,085 kHz (see below), which means I still get my Saturday morning dose of Saturday Night Country. I’ll post an update about 9,580 kHz as soon as I have more details. This entry was posted in Broadcasters, News, Shortwave Radio, What's On Shortwave and tagged 9580 kHz, Radio Australia, Radio Australia Cuts, Radio Australia Pacific Service Cuts on January 31, 2015 by Thomas. 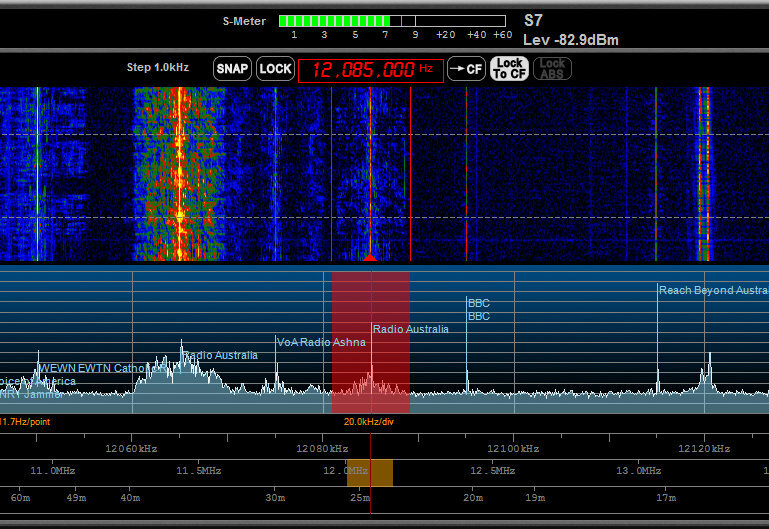 What SDR interface are you using in the screenshot? Also, what data source is providing the frequency/station information? I was using the Elad FDM-S2 (see review here). The Elad application will superimpose memory labels on the spectrum display. The frequency database is coming from EIBI. I probably need to update the frequency list now–fortunately, it’s VERY easy with the Elad application. The FDM-S2 is a great SDR. Hearing Radio Australia now on 9580 kHz in Southern New York at 0930 UTC, coming in easily S9 +20. Last night (Australian Time) I recorded the last transmission from the Brandon site, it’s final job being on 5995kHz. I’m pretty sure have listened to RA on 5995 since I was a young lad with my first shortwave receiver in the 1970s. Last night I captured the whole 49MB as spectrum to record forever the three RA 49MB outlets that run strong during the South Pacific night. I had plenty of HD space reserved for 5995 to continue to the usual signoff in the early Australian morning (1800UTC), however it’s last night was cut short, at midnight Sydney time (1300UTC) she left. It was a historic night for Australian politics as well, the political party that introduced the budget restriction measures that has led to the RA changes looks to be on its final legs as well. Mark: Please bring that spectrum to the SWL Fest! Would love the AF recording for the SW Radio Audio Archive. Glad you had a chance to capture it! Thanks for the post, Thomas. I, like you, often listen to Catherine Britt’s Saturday Night Country every Saturday morning, too. I didn’t know if there was a problem with RA’s transmitters or bad propagation today. The people holding the pursestrings for RA probably don’t care, but I suspect they have lots of loyal listeners here in the US; it remains some of the best programming on radio, period. Correction….1000-1100ut on the music program this morning. 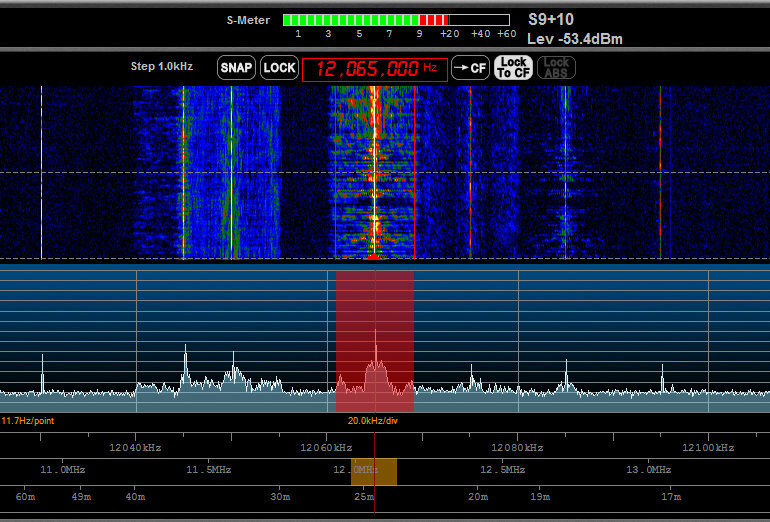 They’re broadcasting ABC on 11880KHz as we speak – a nice signal on the west coast at a little after 1700z. My new regime in the mornings is to listen to the music on KCBS Pyongyang on 6100KHz, so wasn’t listening on 9580. It’s good background as I fumble around and slowly wake up, and there is a certain amount of theater involved in the exotic/surreal sound of the music coming directly from the DPRK. These changes at Radio Australia make me nervous. Perhaps one day, SSTRAN will be selling a shortwave version of their transmitter? That was a tongue in cheek comment, of course. We are a long way from that point but certainly, the SW landscape is changing quite swiftly. Thank you so much for your continued coverage of all things shortwave, Thomas! I heard Radio Australia on 9580 this morning between 900-1000 though reception was far below normal standards. A music program was on while I listened. Global24 on 9393 was not audible for me during the same time, it is generally very strong. I live in south central Connecticut.